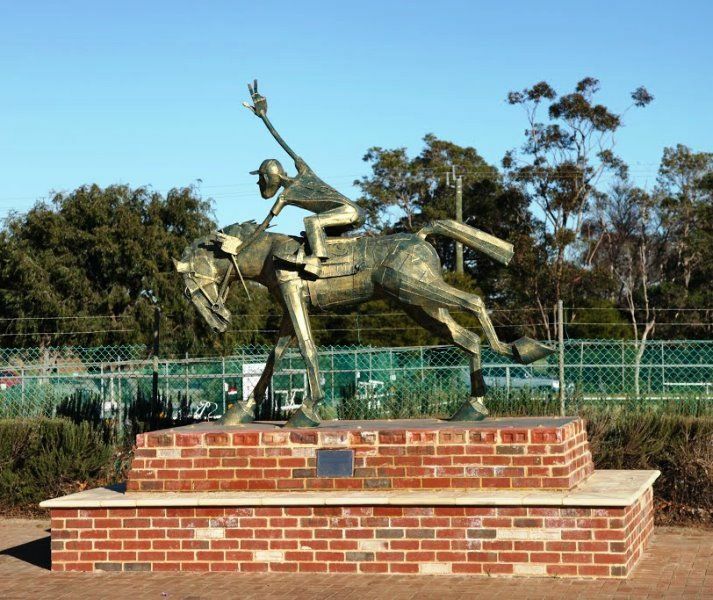 A sculpture of racehorse Rivose, a locally bred horse that dead heated with Eurythmic in the 1919 Perth Cup. Rivose, the dam of Crystal Stream, was a better galloper than her looks would have led to believe. Her greatest achievement was when at the age of nine she dead-heated with the mighty Eurythmic, who was then a three year old and fresh from his Derby triumph, in the Perth Cup of 1919. When Rivose was first taken in hand as a youngster on Mr. Sam Bateman's farm at Beenup, John Jeffrey, her trainer, did not have a filly of very prepossessing appearance to break in. Indeed, she was such a squibby type that the idea of her ever being good enough to win a race was ridiculed. Perseverance on the part of her mentor prevailed, and he had the satisfaction of seeing her record her first success in a Third Class Plate. After being raced on lease by Ted Temby, Rivose later carried the colors of her breeder until quite recently, when she passed into the name of Mr. J. Nicol, whose colors she carries at the present time. The Daily News (Perth) 19th July 1933.